Starting a pallet project without a hammer is like cooking a cake without a mold! A hammer will come in handy for almost all your pallet projects and more generally all your woodworking projects. 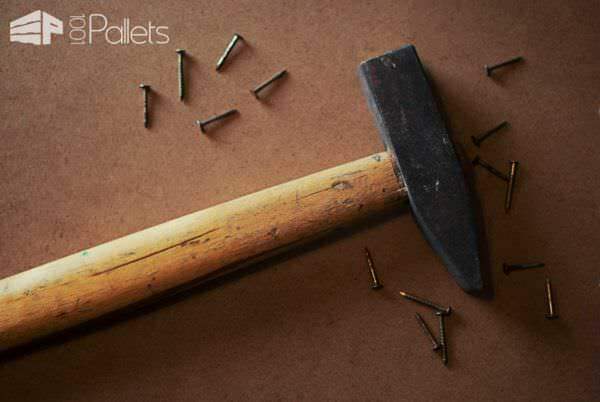 Moreover, a hammer is not the most expensive tool in your pallet crafter kit and is one of the useful ones. There are several types - such as framing, roofing, drywall, ball peen, bricklayers and even sledgehammers. A curved claw hammer is a great all-around handy tool, but you may find you need more types or a different style for your body type. Hammers come in different weights, lengths, and even grip sizes. A pallet project means working with wood and working with wood means cutting it, and guess what, the best invention we have made to cut wood is a saw! :) You need a handsaw, but if your budget permits it, you can buy a powered saw like a jigsaw (very useful for precise cutting) or a circular saw if you need to cut a significant amount of pallet planks. Table saws make quick work of ripping long lengths of pallet wood to narrower sizes. Scroll saws are great for those advanced tasks and doing decorative cutouts. A reciprocating saw (such as a Sawzall) does quick work of disassembling a lot of pallets and has many blade styles that can cut through metal and wood. To sum up, a saw is essential for all your woodworking projects! There are even pull saws (cuts when you pull towards you instead of with the push away from you) and can be easier to use if you have less upper body strength. It seems like an obvious household item, but you’d be surprised at how much you struggle to find one when you need it the most. 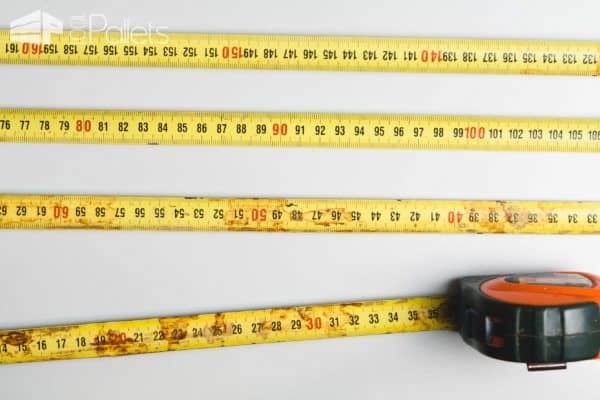 Never lose your tape measure; it is an essential tool! You may find a device that does double-duty. Some rulers also function as a T-square so you can measure AND check for square assembly. 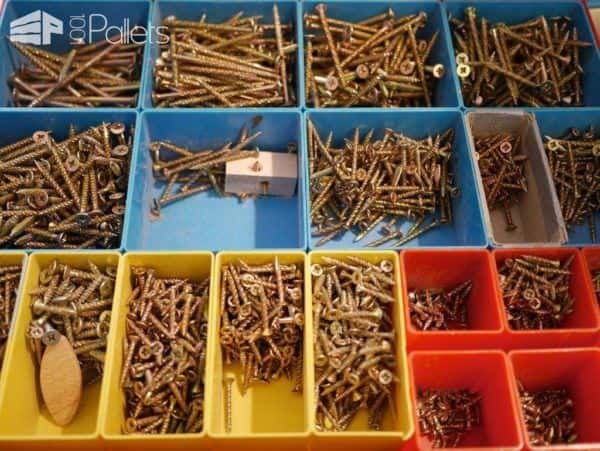 Any pallet project needs screws & nails so must be sure to get prepared and have a variety of nails and wood screws (different sizes and diameters). Some are appropriate for outdoor use (such as stainless steel or deck screws). Some are better for indoor use only, as they don't have the protective coatings or are more prone to rust. If you have to use a lot of longer screws (more than 3"), the different head styles can make a difference, such as a square or Torx style. It gives more surface area for your bit to hold onto and prevents stripping the head of the screw. Whatever the scale of your pallet project, a screwdriver is a handy tool. You can start with an inexpensive, manual one. You'd need a Phillip's, and if you're recycling old hardware, you may need a flat (slotted) screwdriver too. 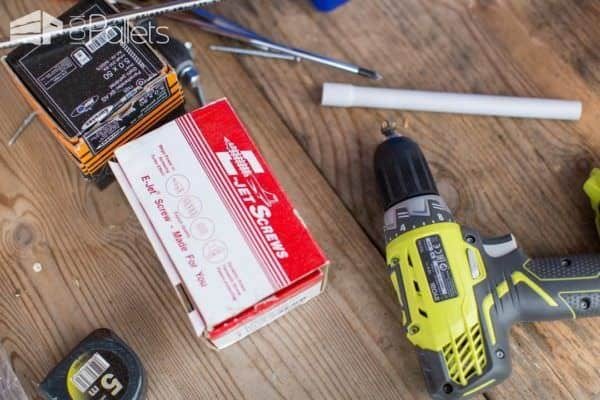 As you start to perform more and more projects, a powered screwdriver will save you time, but more importantly, it will protect your hands and muscles. Powered screwdrivers come in different sizes and weights - so you can find one to fit your personal needs. 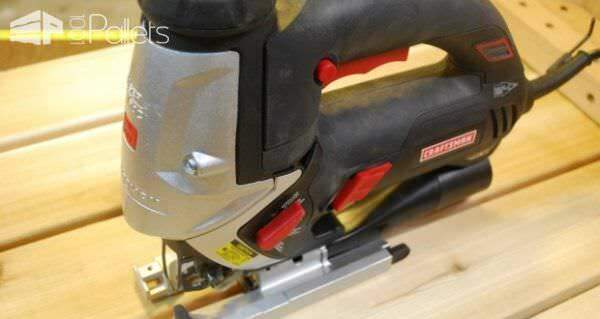 Not one of the most helpful items you could use for working with pallets, but if you want to make some holes on your pallet planks to achieve the particular project, you need a drill. 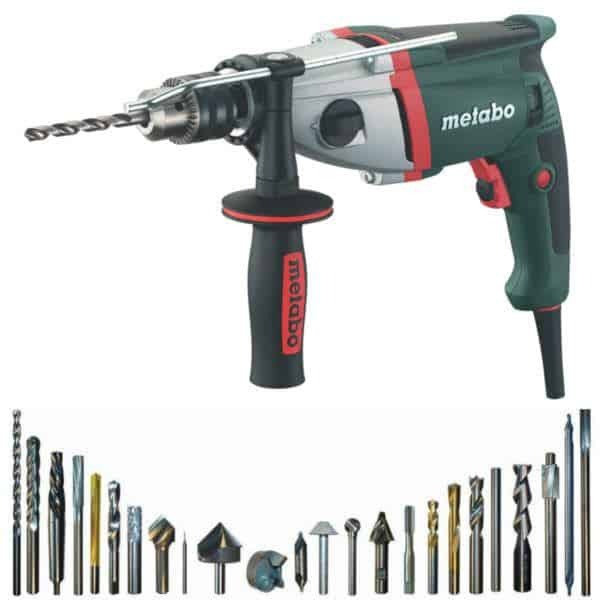 A drill will also be handy for any other crafting project you could have. Drills are great for creating pilot holes. Sometimes pallet wood is aged, and very dry. It'll split apart as you drive a nail or screw through it. A drill will allow you to make a hole slightly smaller than the hardware you're using, allowing the screw to hold the piece without splitting it apart. You can also use a drill to do decorative touches, such as countersinking (drilling out a funnel-shaped hole that lets the screw head to sit flush or slightly below the wood surface). This can add to a polished look. 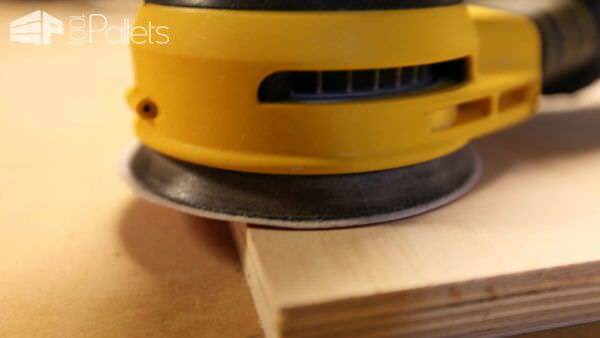 A sander is particularly useful to prepare pallet wood. You can use one to simply remove the very rough edges and splinters, or all the way down to fine finish work. Sanding can be part of your finish or as a preparation step before applying any treatment on it like painting or varnish. Maybe you prefer the raw aspect of the pallet wood, but a sander will come in handy for any crafting project that involves some pieces of wood. There are different types: Random-Orbital sanders, palm sanders, sanding blocks, belt sanders, disc sanders, drum sanders, and more. You can even use sanding attachments on your small rotary tools. Safety first part one: safety goggles are essential for any woodworking project. Make sure you don’t forget about these – your eyes will certainly thank you! Remember - EVERY STEP of a pallet project could result in eye injury. Find a pair that you feel is comfortable. You won't wear them if they don't fit well. 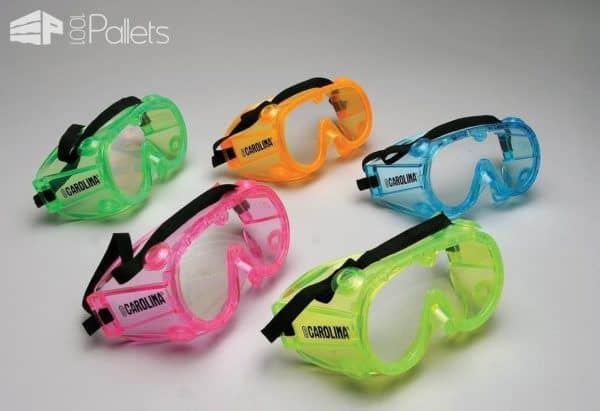 Proper safety goggles come in many styles now and look like "regular" sunglasses, but they're impact resistant. Don't forget to protect yourself from damaging UV rays! Safety first part two: safety gloves are also essentials when working with wood and even more with pallets. 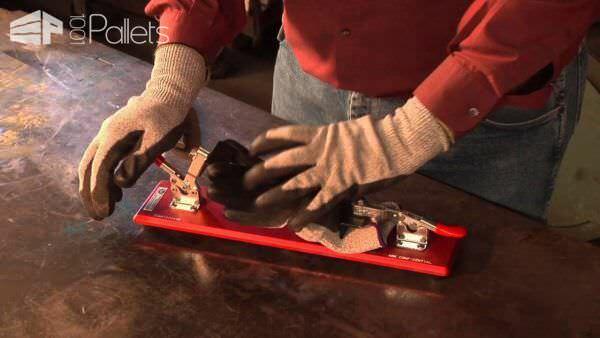 If you want to avoid splinters, which pallet wood is perfect for, don't forget your gloves. Sometimes, your wood piles can also become a haven for bugs and spiders. Some are VERY poisonous. Don't forget - spiders are also fond of the underside of the bins, trash cans, and containers that a lot of us DIY'ers have. Gloves can prevent injury! Follow your manufacturer's guidelines when using gloves and power tools. 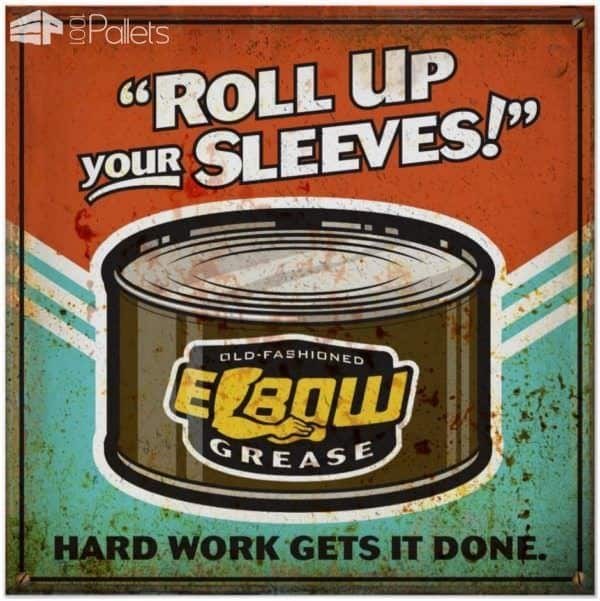 Yes, this is the must-have tool :) Take a good breakfast or a healthy lunch before starting any woodworking project as you will need a lot of elbow grease to achieve it ;) Remember - HYDRATE! Getting fatigued can result in an injury. Prybar, chop saw, wood chisel, clamps, nail punch, hand plane (smallish), Sawzall (to get the pallets em apart), draw knife, bolt cutters, spokeshave, custom built prybar, pallet tool, and vice grip. Do you use any other tools for your pallet works? Which device are you finding the must-to-have? Share with us in the comments. This all tools are very useful. I’d add a wire brush and a paint scraper because some pallets have residue on them that needs removal. A hot air gun can also be useful. And some big heavy duty c-clamps or tie-downs to provide ‘an extra pair of hands’ – and stop work shifting. In addition to safety mask or goggles – a facemask to prevent inhalation of sanding particles. Your lungs will thank you. I have a problem well I’m still new to this pallet business and I don’t know which tool to use to secure nails/screws into my pallets for a couch I am making. I have been advised to us a drill to more a hole Ben hammer a nail in, I was also told to use a screwdriver but then it might damage my wood. screw’s last longer don’t pull out like nails but also depends on the project ect…but a couch Definitely screws go to your local Lowe’s or Hope Dept let hardware know what your building they will show you your options. In my experience, the most important tool for working with pallets is the Reciprocating Power Saw. This works like a hacksaw but has the added advantage of having a motor to do all the work & without the frame to get in the way. Increasingly, twisted nails are being used to hold pallets together & any attempt to dismantle them using leverage is likely to result in splitting the wood. WARNING: Never strike a hammer with another hammer. Steel hammers are hardened and will shatter. I am so sorry you were injured Krystal. My essentials, besides those you listed , are 1.) a Pallet Paw- best investment ever! 2.) an air brad nail gun. 3.) a Dremel Saw and like you said the hammer, miter saw, nails screws, various bits. I love working with them. I want a planer but its not a necessity right now. My two essential tools for deconstructing a pallet are two pieces of wood. One 4×2 with no knots about 1.2m long, dressed is best because it’s smoother and slightly thinner than rough sawn. The other piece should be slightly longer and thicker, maybe 4×4. The only special tools needed to assure the yield of the highest possible level of quality material from every pallet is to use a punch to remove the base and deck boards. This will allow the nails to remain upright so that they can be driven back more easily. The punches can be made from the stringers, one straight on both faces and the other 45 degree angle on its wide face end. Hi Jerry Buerge – so like a homemade pallet wrecking bar? We’d love to see a photo of what you’re describing. I think I’ve got it, but I’d love to even see a vid. of you using it. If you want, show us how to make the tool you’re talking about, and how to use it in a video tutorial. We’d post it up for you!!!! A pencil and some kind of support ie saw horses come in handy too. Hi all! Just wanted to say I think I disagree with the sawzall. It may save time, but if you cut the heads off the nails then they are stuck in there and you can’t tell where! If you try and plane it after that you will ruin your blades. Maybe we can have a tutorial on building a cubby without having to dismantle the pallets. As a single mum of two… and with back problems and no one to help me, I thought I’d make a cubby out of pallets and these frames i bought. I have to say hands down it’s the sawsall for me. My son and I did our first project without one and it took us half the day just getting enough whole slates to make candle holders! You wanna save time, energy, and wood, invest in one. So so true! I destroyed the $30 Harbor Freight sawzall in about 40 pallets’ time. Harbor Freight tools are great for a novice to get started or very periodic wood worker, but their quality is awful. My $100 bevel/slide miter saw started falling apart 30 pallets deep. a duckbill deck wrecker! it pulls the nails so much easier, especially if you have problems working on your hands and knees. OMG I love the name of that tool – Try saying “duckbill deck wrecker” ten times fast! Now I’ve gotta go out and see one. You’ve peaked my interest in a new, handy tool, Tina! :-D Thanks! Sorry, but that was bit of a pointless post. What would be more helpful is tools and techniques for dismantling pallets as this is the most frustrating and time consuming part of any pallet project. I am finding that the nails are so long and heavy duty that I am splitting more planks than I am saving. I watched a video of a guy using a Milwaukee Sawzall to dismantle a pallet in less than 2 minutes. I bought a SKILL sawzall for $50 and it DOES work.. 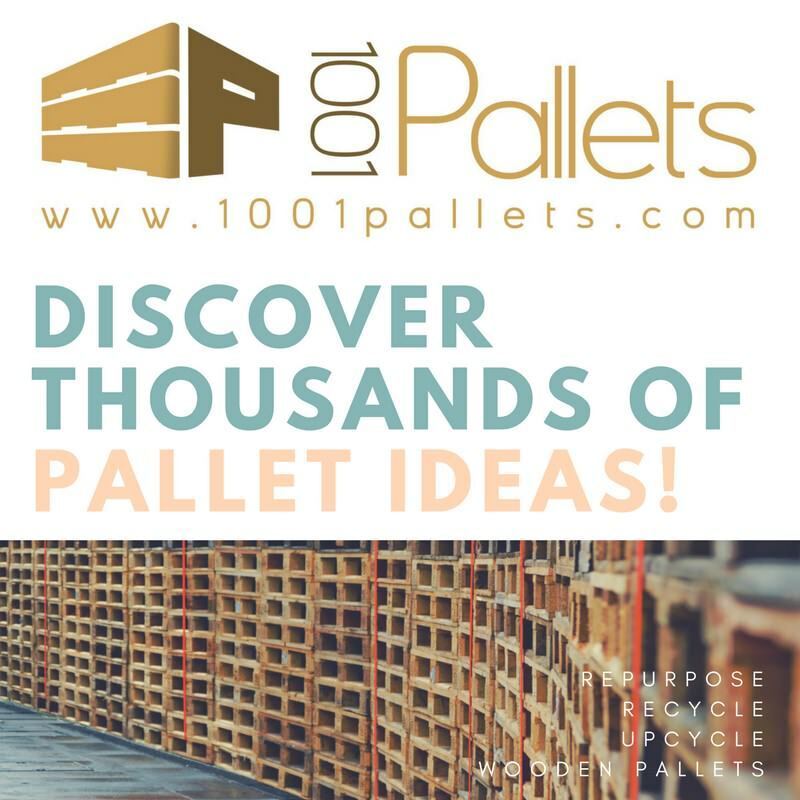 If you want to learn how to dismantle pallets, check out my profile there is a link to my YouTube channel. In there you will find my playlist for dismantling pallets. I make those videos myself, and am very open to feedback. Karell’s right – he makes great vids! Thanks – Heather the Admin. Assistant. Yup – totally agree. It’s wonderful when I am doing parts of the projects that DON’T require sanding and I can take off the darn mask. I’ve got so many allergies (including to some of the woods -d’oh! ), that my doctors are all yelling at me to wear the mask even when I’m doing things like moving my stacks of wood around in case any have mold on them.